The Birthplace at Summerlin Hospital Medical Center offers advanced services for moms and babies in a comfortable environment for families to share those first special moments. Our private suites feature soft color schemes, beautiful décor, even hardwood floors and beautiful views that complement these serene surroundings. 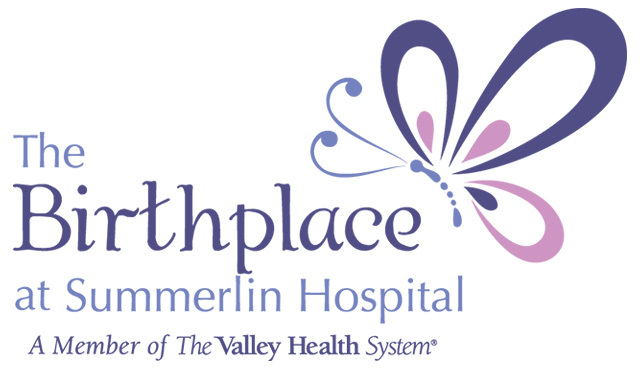 When you have your baby at The Birthplace at Summerlin Hospital, you'll stay in one of our private suites, and be under the care of our specially-trained staff. As part of our laborist program, an in-house OB/GYN is present at the hospital 24 hours a day, seven days a week for emergencies or to assist other OB/GYNs. If needed, cesarean surgical suites are located on the unit for quicker access and more privacy. The Birthplace has a Level III Nursery/Neonatal Intensive Care Unit (NICU) should your baby need special care, as well as perinatal testing and an antepartum unit for women with high-risk pregnancies. The Birthplace not only provides in-room accommodations for dads or birth partners, but siblings are welcome to visit their new baby brother or sister too. And newborns stay in the room with mom so you can spend the most time with your new addition. Tours of The Birthplace are provided several times a month. There is a maximum of 40 people per tour, so call 702-233-7103 for dates, times and to reserve your place on a tour. Infant security is an important issue for every maternity unit, but Summerlin Hospital is breaking new ground in Las Vegas by offering a special component in infant protection that matches moms with their newborn. A new component of the Hugs® Infant Protection System by Xmark, Kisses™ automatically confirms that the right baby is with the right mom by giving an audible signal to indicate a match or mismatch. The Birthplace, Summerlin Hospital’s childbirth education program, has expanded its programming to offer classes on a wider range of topics for families. The new classes and support groups offered by The Birthplace are designed to meet the needs of families as they grow and change over time. Classes and checkups offered through The Birthplace now include free car seat checks, natural childbirth methods, breastfeeding and hypnobirthing. Only one adult may stay overnight in Labor and Delivery/Postpartum to assist the mother. It is the parent's responsibility to have a car seat installed properly in their vehicle before mom and baby are discharged. Hospital staff members are not permitted to assist with car seat installation. We recommend every expectant parent contact our financial counselor before the birth of their child so there are no financial surprises during this very precious time. Please call our financial counselor at 702-233-7668. Follow these important tips provided by Safercar.gov for properly installing car seats. Whether it's your first child or an addition to your family, The Birthplace offers a wide range of prenatal and postnatal classes and support groups to help you prepare. The Children's Medical Center provides advanced care to infants, children, adolescents and teenagers.